One of the oldest civilizations on Earth, the indigenous peoples of Turkana have lived isolated in Kenya's remote northwest for thousands of years. Existing in the tormented, war-torn heart of the continent, their way of life is now threatened by the added pressure of Kakuma Refugee Camp. Families from Sudan and East Africa, fleeing the violence of civil war in their homelands, have sought sanctuary here since 1992. The dueling struggles for the sparse resources of this unforgiving region touched author and photographer Daniel Cheng Yang. With passion, dedication, and compassion, he conveys the harsh reality of refugee life in his imagery-the plight of the over 40 million refugees in the world today-and the conflict between ancient traditional and contemporary civilizations. A powerful, moving documentary of forgotten peoples, Daniel's photographic work has gained international attention for its depth of human expression and been shown in Paris at the Louvre, as well as in New York, Yokohama, and Minneapolis. 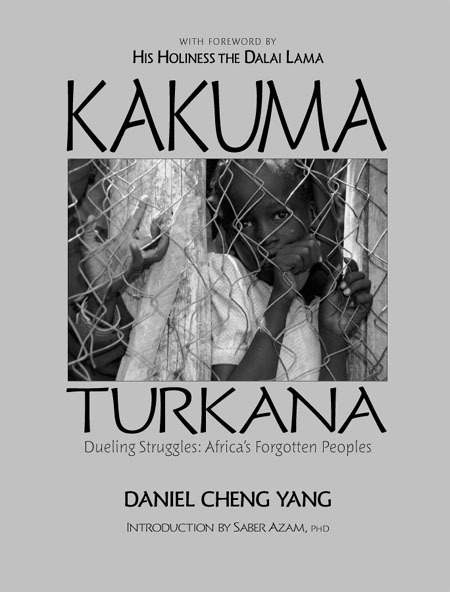 Daniel was only 16 years old when he made his first visit to Kakuma and the Turkana villages. His youthfulness and openness endeared him to the Lost Boys of Sudan at the refugee camp, as well as to the Turkana tribal elders. His photographs provide a rare, intimate look at the remarkably divergent lives of native East Africans surviving despite unimaginable deprivation. 92 pp, 9" x 12"
All rights reserved © 1995-2017 PANGAEA.